The following are the Sediment Control products that are distributed and installed by ACF. Amoco Offers A Variety Of Silt Fence Fabrics To Accommodate A Wide Range Of Requirements. Amoco Silt Fence Fabrics are designed specifically to reduce soil sediment run off from, or into, protected areas, They function in a manner similar to a sedimentation basin in which water is allowed to filter through the fabric while suspended soil particles settle to the ground. This restricts the loss of costly soil from the site while permitting the water to drain efficiently. These fabrics are made of polypropylene with ultraviolet stabilizers to resist degradation caused by exposure to sunlight. Polypropylene is one of the most inert textile polymers available and highly resistant to commonly encountered soil chemicals, mildew, and bacteria. Amoco 2122- This woven silt fence product provides a unique combination of soil filtering efficiency and maximum water flow rate. It was specifically designed to meet the demanding requirements of clay soils. Amoco 2127- This is Amoco's most economical fencing fabric, designed to meet the needs of the open-specification market. Amoco 2130- Offers the highest soil filtering efficiency, and the lowest flow rate to meet ASTM D 5141 and VTM 51 requirements. Amoco 2155- Amoco 2155 includes a reinforcement strap near the top of the fabric for added strength where it is needed most. The strap can also be used for quick, easy post attachment. Amoco 1198- High flow rate, very high strength, long lasting, with enhanced resistance to sunlight exposure. Amoco 4545- Amoco's nonwoven geotextile used when a supported nonwoven silt fence is required. 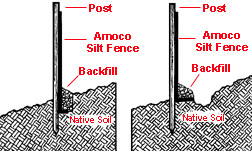 To install silt fence, simply drive stakes and attach Amoco Silt Fence fabric with a stapler. An alternate method of installation is the use of preassembled siltfence. Posts are preattached to the fabric, allowing convenient installation. Simply unroll, stretch, and drive stakes. Make sure that all supporting posts are on the down slope side of the fencing. The bottom of the fabric should be placed under 6 inches of compacted soil to prevent sediment flow underneath the fence.